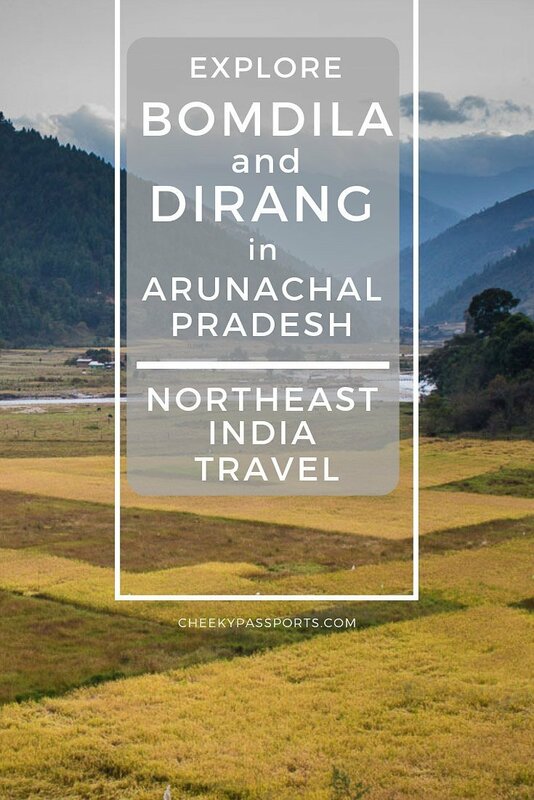 Have you considered traveling to Arunachal Pradesh in Northeast India? The mountainous state is home to a few of the last unexplored places in the world, where traveling is as difficult as it gets, but more rewarding than anything we’ve ever experienced before. 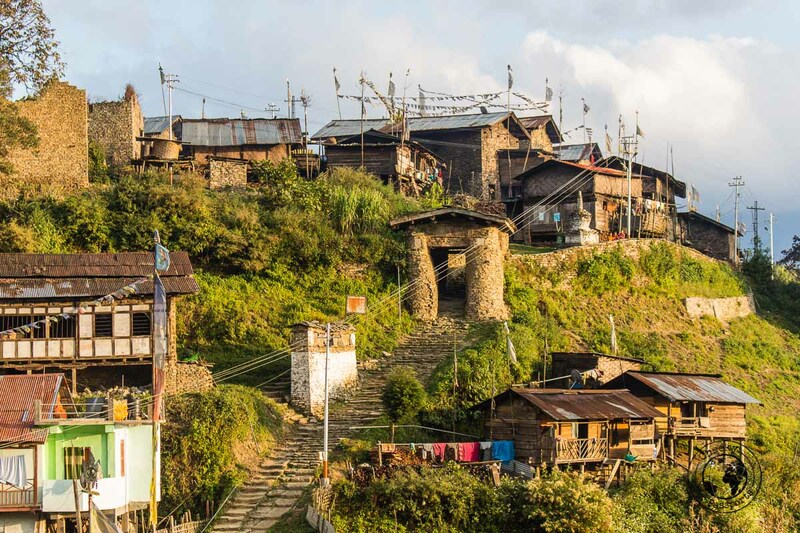 The villages of Dirang and Bomdila in West Kameng, are a popular stop on the route to Tawang (one of the most-visited places in Arunachal Pradesh which we will cover in a separate post). The road to Tawang is long and difficult, so using Dirang or Bomdila in the West Kameng district as a stop on the way to Tawang, is a highly convenient way of making the journey more pleasant. 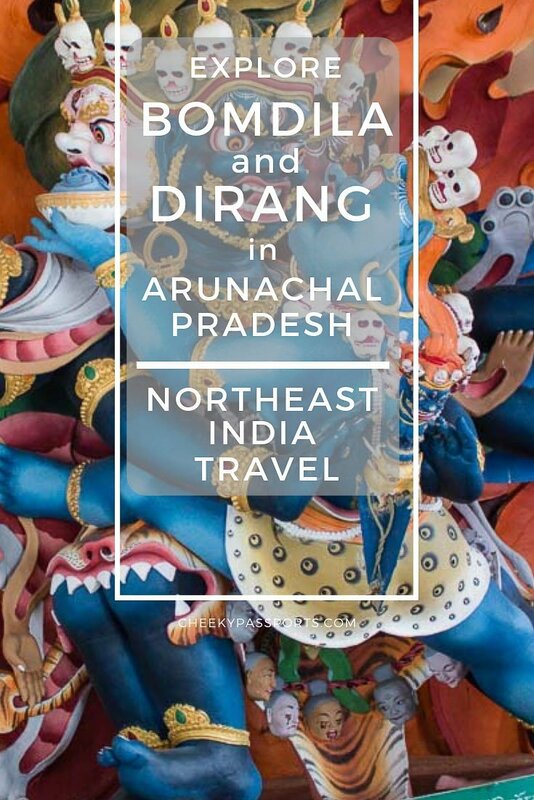 For people with no experience of Arunachal Pradesh or Northeast India travel, choosing between the two might sound complicated, so we are publishing this guide to help you learn about all the places to visit in Dirang, and the best of Bomdila sightseeing, so that you may choose the best stopover to suit your budget and needs. First a little about Arunachal Pradesh though! One of the least-visited states in India, happens to be one of the most beautiful regions that we have ever explored, perhaps similar to Bhutan, but with even less foreigners around, and a more approachable budget. It really felt as though we were traveling in one of the world’s forgotten regions, which travelers still have to find their way to. Due to very poor infrastructure, and a wholly mountainous terrain, traveling in Arunachal Pradesh is tough and time consuming. It also requires a protected area permit (PAP) for foreigners or an Inner Line Permit (ILP) for Indians, which is inspected at regular check-points, and which is issued for a maximum of 30 days. There’s not much information about Arunachal online, so devising an itinerary is a bit of a shot in the dark, and transportation is nothing short of a nightmare. We soon realized that in order to gain insight into the fascinating and little-known local tribal culture of Arunachal’s West Kameng district, and to access places to visit in Dirang or Bomdila which are off the beaten track, a vehicle and a guide would be essential. This is when we got in touch with the resourceful Sange of Holiday Scout who arranged our Dirang and Bomdila sightseeing tour in ways we could never have managed ourselves. Need help planning your trip and getting your permits? Make sure to contact the experts at The Holiday Scout! Your port of entry to Dirang and Bomdila in West Kameng, is likely to be Guwahati, the gateway to Northeast India travel for most people. Guwahati is a convenient place from which to plan your upcoming Northeast India travel itinerary and serves as a transport hub for entry into Arunachal Pradesh. Both Dirang and Bomdila can be accessed from Guwahati by sumo (more on that below). Guwahati hotels are plentiful, and choice of accommodation will depend on your budget and desired location. Budget, mid-range and higher-end Guwahati hotels can be found all over town. Our choice of accommodation was Hotel Monsoon Palace in Paltan Bazaar, which we selected based on the fact that it was located within walking distance of the train station and the sumo stand. If you’re looking at mid-range Guwahati hotels, Awesome Palace has good reviews whilst Vivanta Guwahati seems like a good place to stay if you have the budget for it! The West Kameng district (which is home to both Bomdila and Dirang) in Arunachal Pradesh is graced with lush mountainous scenery, and a rich culture and heritage which make the district a delightful place to explore. 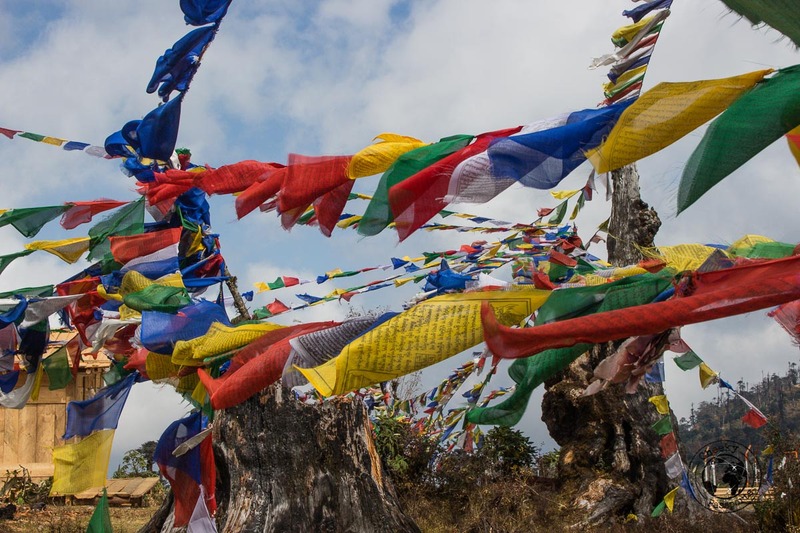 Although we have previously mentioned that Bomdila and Dirang in West Kameng are popular stopovers on the Tawang route, we soon discovered that both destinations have much to offer to the intrepid traveler and are worth exploring on their own merit. Bomdila is home to some fascinating monasteries, whilst places to visit in Dirang include the spectacular Sangti Valley and the enchanting Dirang Dzong. 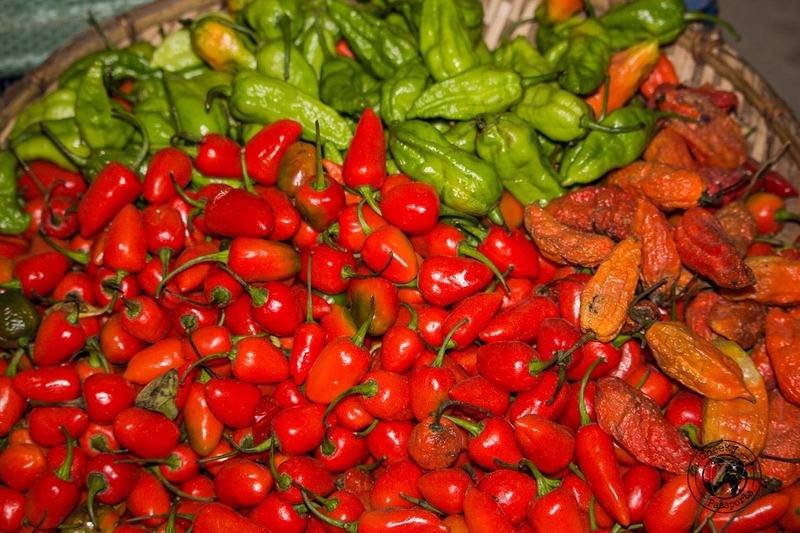 There are stark differences however between Bomdila and Dirang. Bomdila is located at the side of a mountain and is the colder of the two destinations, with chilly winds passing through the town, whilst Dirang is situated in a valley which is mostly protected and warmer. Be aware that Arunachal Pradesh is subject to mountain weather which can change unexpectedly, so even when you feel warm, be sure to take a jacket around with you! The best time to visit Bomdila and Dirang is in the winter and spring season between October and April. During this time, there are better chances of experiencing clear, blue skies. The summer months are subject to monsoon weather. 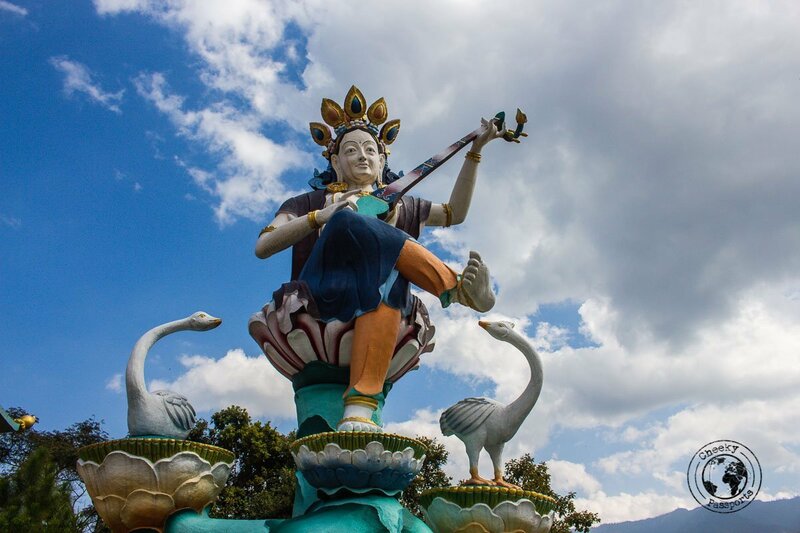 Also known as the Gontse Gaden Rabyel Lling Monastery, this is the main attraction in Bomdila and should definitely secure an important place on your Bomdila sightseeing itinerary! 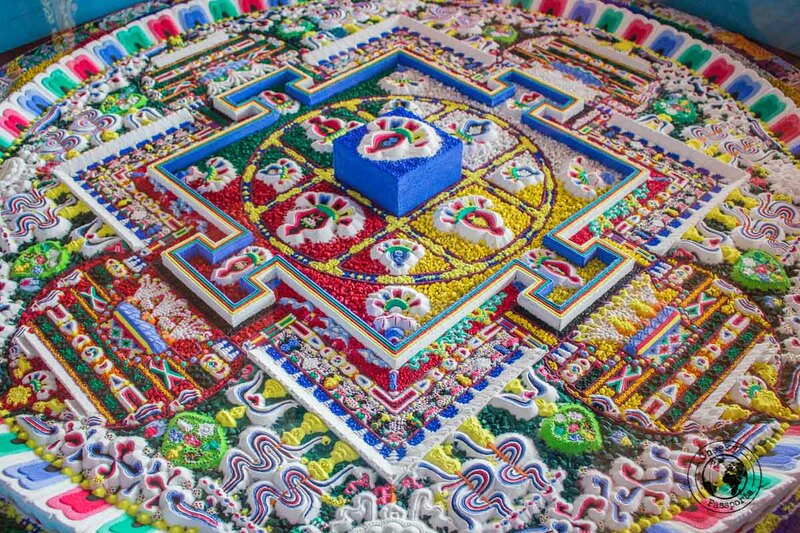 It is considered to be an important center of Mahayana Buddhism and consists of the Lower, Middle and Upper Gompa. The Upper Gompa is the main monastery. 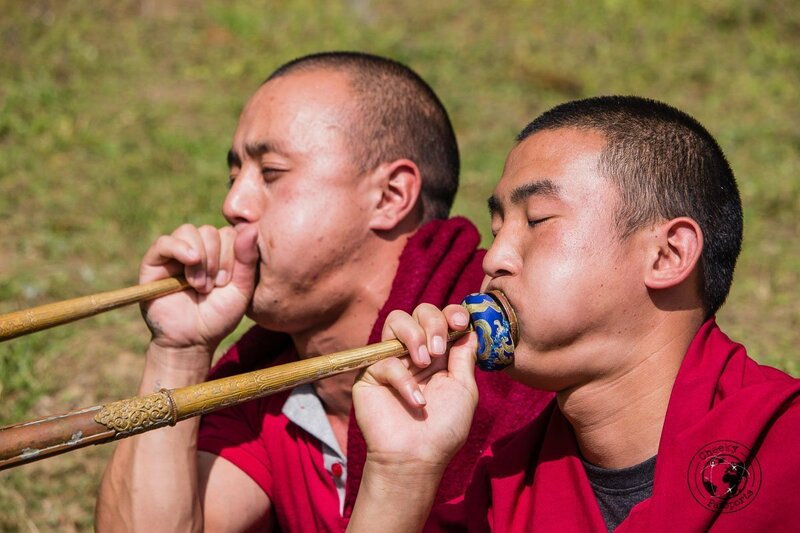 During our visit we were lucky enough to witness many of the monks engaging in several practice routines in preparation for an upcoming festival. 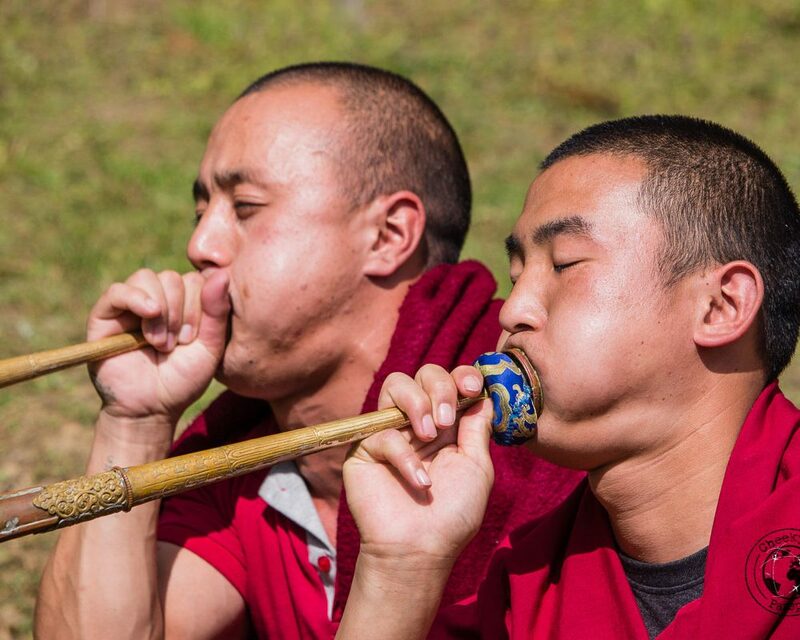 Some monks were going over some dancing steps whilst others were practicing playing the Tibetan horn (the dungchen). 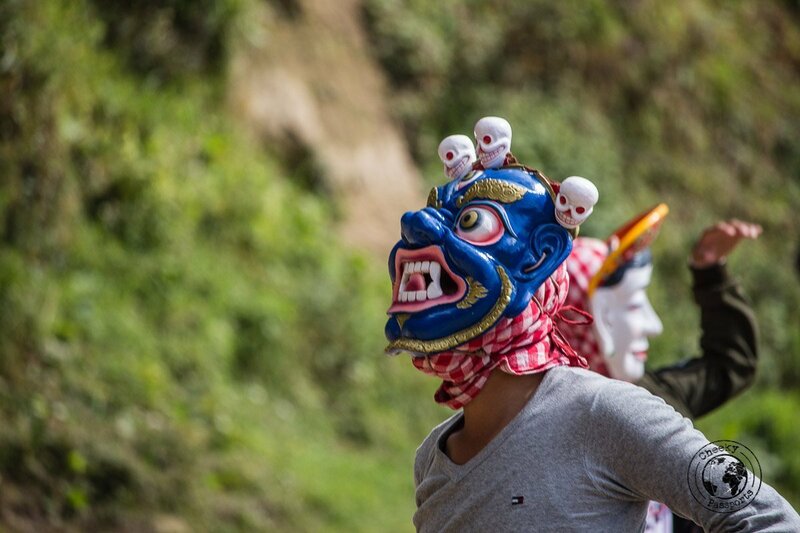 One monk was making festival clothes, and another was painting masks. 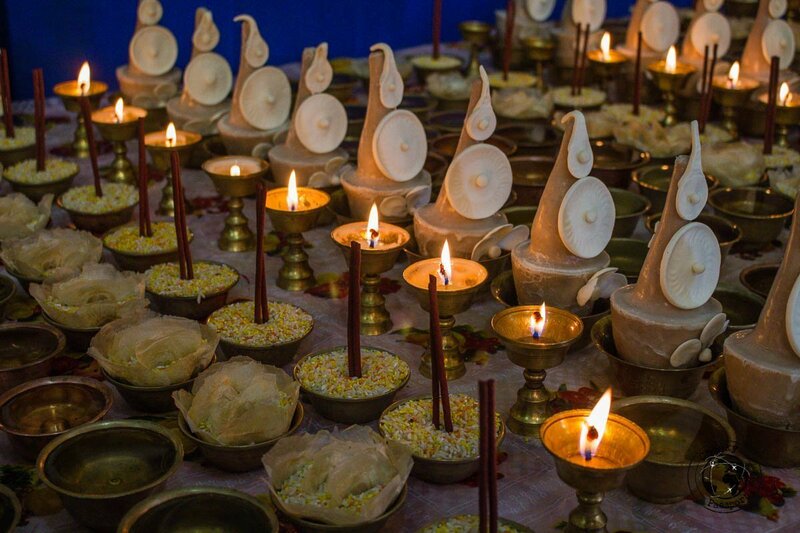 We were also taken to a room which was full of butter effigies made by student monks for Losar, celebrated towards the start of the following year. 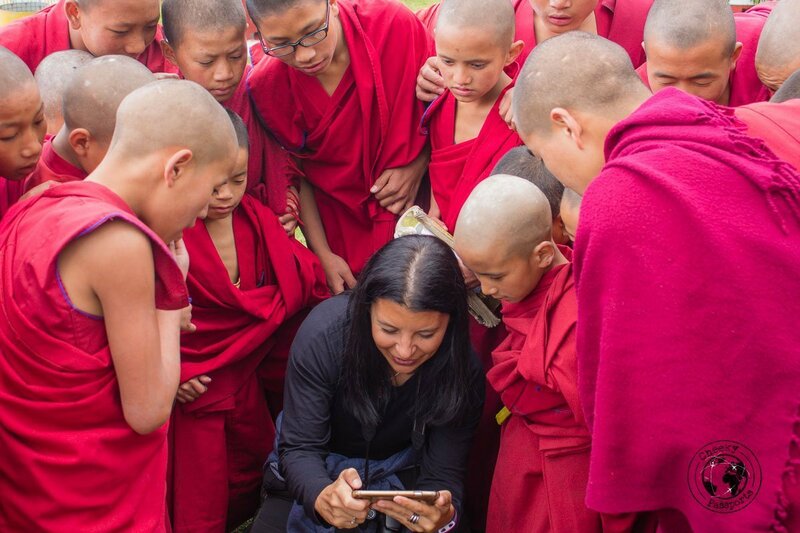 The GRL Monastery was without doubt one of the highlights of our Bomdila sightseeing tour, and should not be missed if you’re visiting the region! I believe that we were super lucky to find all the monks going about their festivity preparations, but it seems to be a fascinating place to visit in Bomdila even if you don’t get the opportunity to experience this. The monastery is located about 4km out of town and can be reached by private vehicle in about fifteen minutes, or via an uphill one hour walk. This monastery is located at the top of a rather high mountain, about an hour’s drive away from Bomdila. It can only be accessed by private vehicle. 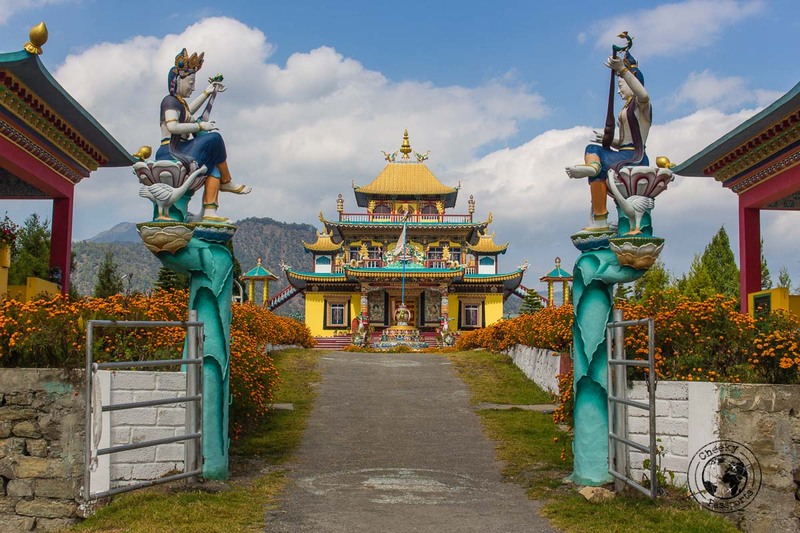 The mountain is surrounded by gorgeous scenery and its bright colours against the mountain backdrop, as well as the extraordinary views to be had from the monastery’s upper levels, make it one of the best places to include in your Bomdila sightseeing itinerary, even if it can be rather difficult to get to! Sange took us to a viewpoint on our first evening in Bomdila. It was just out of town and provided great views over the surroundings. Unfortunately, it was a little foggy so we couldn’t get clear pictures! It seems like a great place from where to get a good look at the town on a clear day! This little market is located in the town’s main street and we loved discovering all the vegetables and food products here! I was fascinated by what looked like a dried black weed or fungus which Sange purchased and asked his sisters to cook for us. It was delicious! We also tried Churpi, aka Himalayan chewing gum! It comes in two variants, soft and white, or hard and brown, depending on the drying time, and tastes of yak milk. It is so called because it is so chewy of course. We found the soft one to be pretty hard, so I can’t imagine what the hard Churpi is really like! 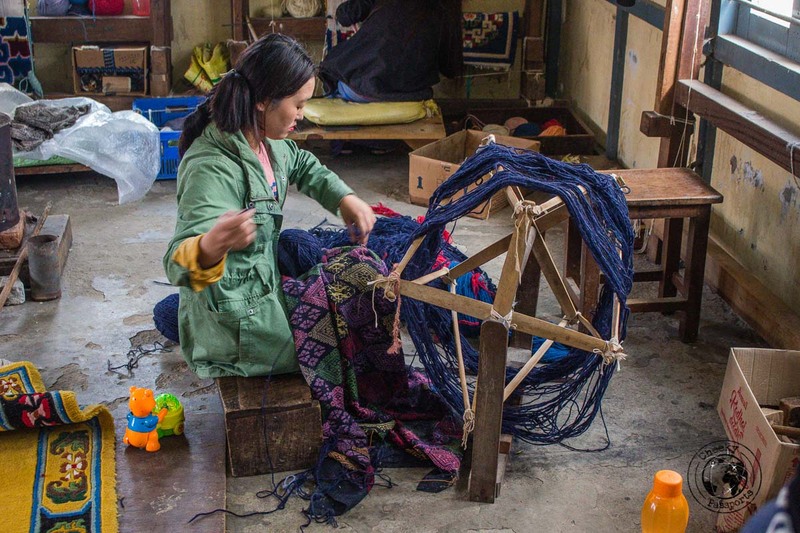 This centre, established by the Arunachal government, is a great place in which to see local people making their beautiful crafts. 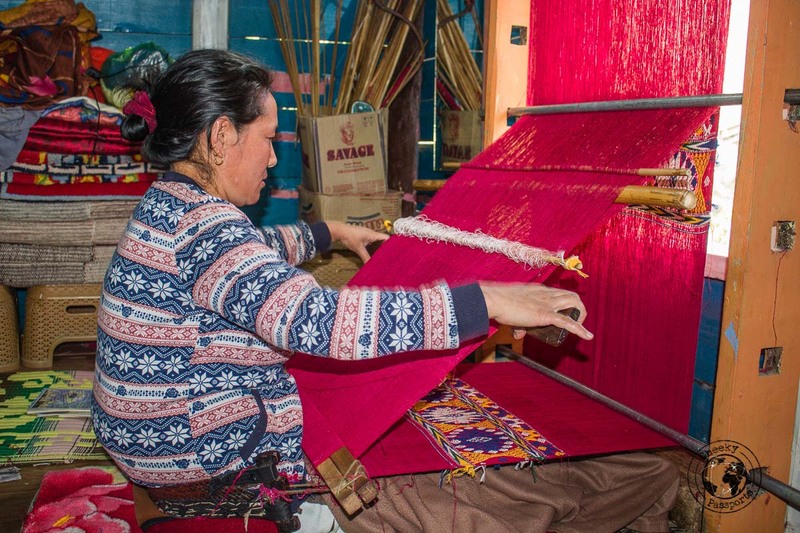 We were impressed by the attention to detail and care that went into making local carpets! There’s a little shop from where you can buy the local handicrafts including carvings, weaved products and masks. 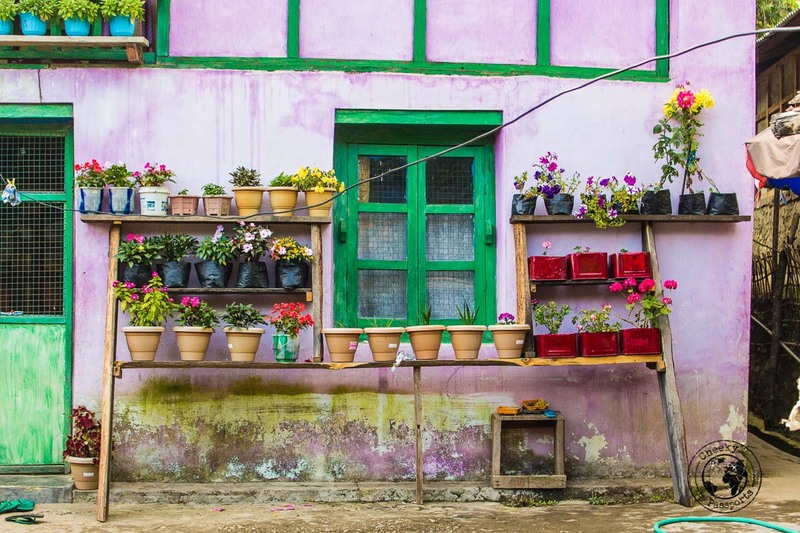 As we are discovering during our Northeast India travel experience, accommodation throughout this region of India usually consists of homestays with few hotels in the larger villages. 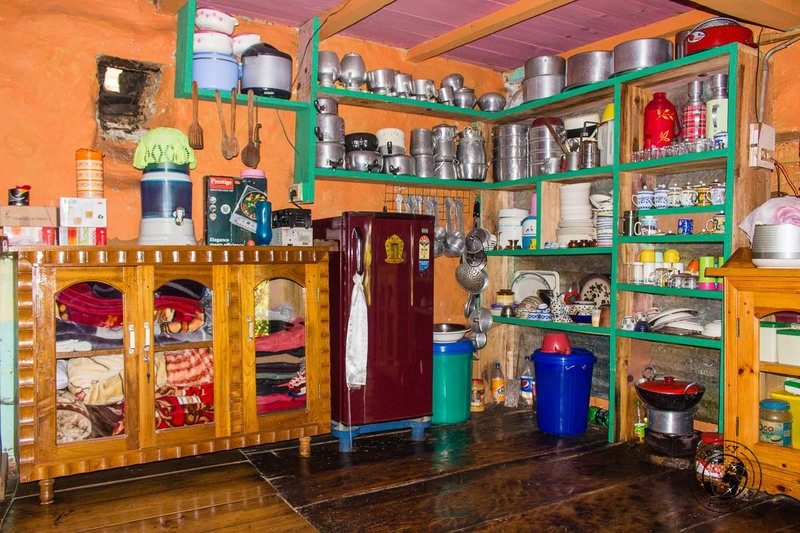 Our preferred type of accommodation during our Northeast India travel is without doubt the homestays that can be found in most of the villages to host travelers. They tend to be very cozy and usually run by lovely families who do their very best to ensure that you have a comfortable stay. We had some of the best food when staying in homestays too! We were hosted by Sange and his three lovely sisters at his own house for another couple of nights in Bomdila as part of our Holiday Scout tour. This ensured that we got some lovely family time which is exactly the kind experience we like to look for in our travels. 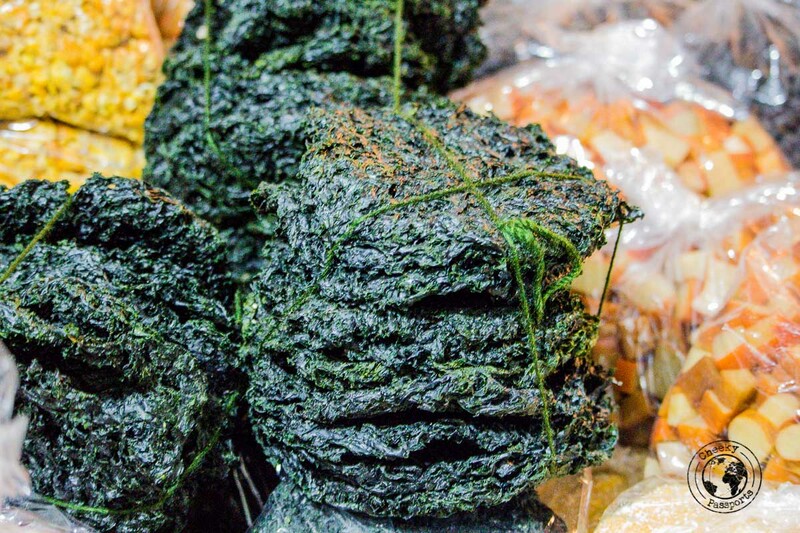 One of his sisters (who wishes to become a chef in the future), dished out some fantastic local dishes including one with a kind of dried black vegetable I spotted at the local market earlier on and which we wanted to taste! We think she’s got great potential! If you’re traveling independently, Bomdila hotels and other types of accommodation can be booked here. There are several ways in which to travel from Guwahati to Bomdila. You can hop onto a shared sumo running from Guwahati to Bomdila like we did. The uncomfortable eight-hour journey cost Rs700 (€8.75) each. Sumos leave from the sumo stand near the train station in Guwahati early morning (at around 6am), and it would be wise to book your ticket beforehand – the day before travel should be fine. If you are lucky, you will have the opportunity to choose your seats. Sumos fit in ten passengers (sometimes more). Two passengers are seated in the front, next to the driver, and four passengers each on the rows behind. If you are a rather large person (like… well, you know who), we really advise you to book seat no. 1. This is the seat at the front near the window, so there will be one other person between you and the driver, who often has to cope with the discomfort of the gearbox stick. Your luggage will be kept on the rack at the top, often uncovered, so be sure to cover it with an impermeable transit case. If not, you might not recognize your bag by the end of your journey! If you’re also carrying a daypack, try not to stuff too much into it. You will need to keep it on your lap and we assure you that it all gets very uncomfortable! You can also choose to hire a private cab to travel from Guwahati to Bomdila. This will be very expensive but includes the advantages of having a lot more space. Note that when crossing from Guwahati to Bomdila, your ILP or PAP will be checked by government officials. Be sure to keep in handy (inclusive of multiple copies which may be requested)! Another affordable way of traveling from Guwahati to Bomdila is to take one of the many ASTC buses running from Guwahati to Tezpur and a subsequent sumo from Tezpur to Bomdila. The tribal area of Dirang Dzong, located about 5km away from Dirang town should be at the top of your places to visit in Dirang. 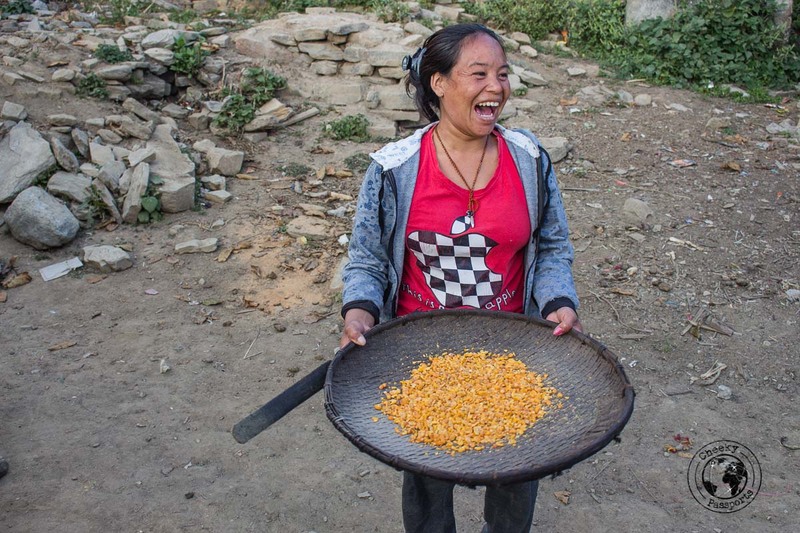 Our walk through the tribal village started from the ancient Khastung Monastery at the top of the Dzong, in between cobbled lanes and gardens, in which women were drying corn and chilis and a fermented soy product. Sange knew all the local people and we were even invited into the homes of one of his acquaintances for a cup of tea and dried millet. She proudly showed us what her house is like. The largest part of the house, and the room with the most beautiful view is dedicated to praying! 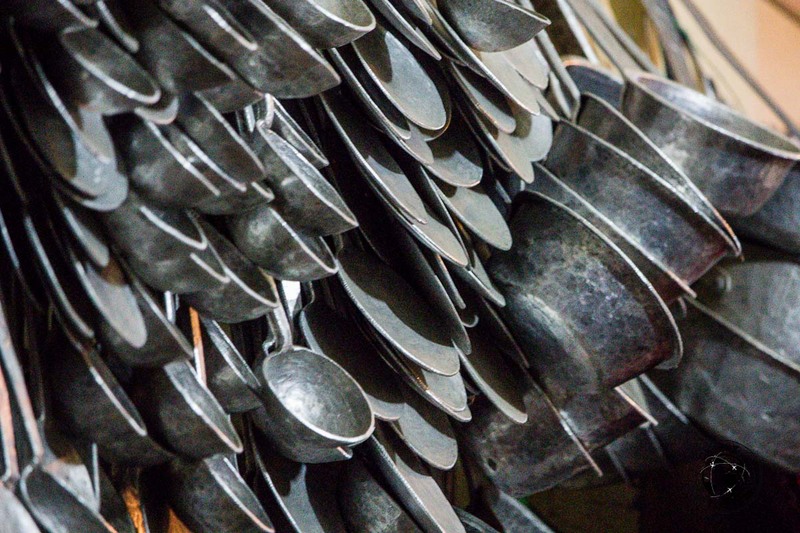 The bottom part of the house consists of bedrooms and a large kitchen which was full of very shiny pots and kitchen items. It is apparently considered auspicious to have a very clean spotless kitchen with all your items displayed neatly. I could only wish that my kitchen at home looked like this! Sange also showed us a water mill which is still used to grind corn to a soft powder. One of the reasons we enjoy having a guide when visiting tribal areas is the opportunity to discover and understand local life. I am sure that we would have enjoyed exploring the village independently, but we could have hardly knocked on someone’s door and asked for tea and millet and to take a look at their kitchen! Sangti Valley is one other destination which should make it to your list of places to visit in Dirang. The valley is located about 15km away from Dirang, and is only accessible via private vehicle along a very bad road. Sangti Valley is home to some beautiful views over the river with lots of cows and horses grazing by the riverside. Sange noticed a local woman brewing corn liquor in her front yard at some point, and we stopped for a glass (or rather, stopped for me to have a glass, since Nikki and Sange don’t drink) before we continued our tour. I was probably also a little dehydrated at that point, but I started to feel rather light-headed after one glass of the potent brew! There’s also a sheep-breeding farm in Sangti Valley which is where Sange stopped to take some drone footage. The sheep were not exactly impressed with the drone and many were actually rather scared! 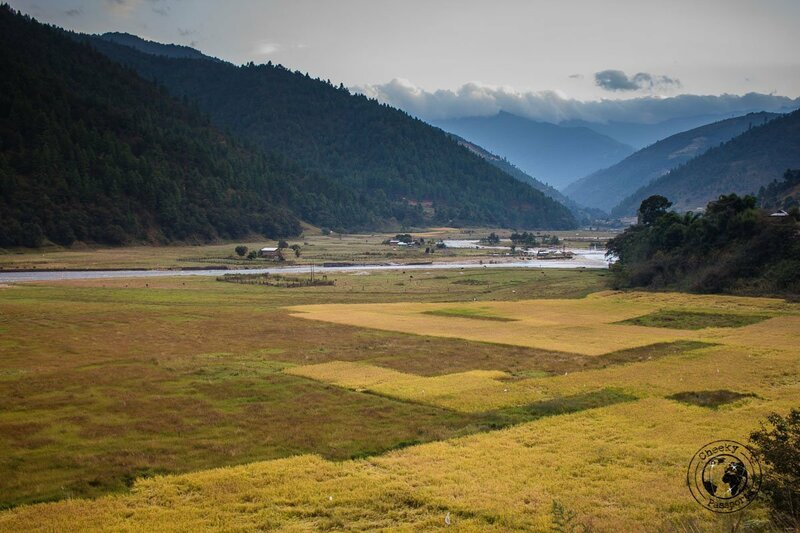 Sangti Valley is actually famous in the area for being the breeding location of the rare black-necked crane, also found in the Phobjikha valley in Bhutan, but we didn’t see any, probably because we were not there at the right time of year. This very new Thubsung Dhargye Ling Monastery, (only inaugurated in 2017) is one of the best places to visit in Dirang early in the morning at prayer time. Although Sange took us to see the monastery late in the evening so that we could see the monastery bathed in golden colours, he took us again right after sunrise so that we could experience Buddhist prayers in the peaceful setting. Despite having visited several Buddhist monasteries before, it was the first time that we actually sat though chanting and prayers and although we didn’t understand much, we found the experience fascinating! We loved the community feeling, where tea and sweet bread was served and shared after prayers were concluded! 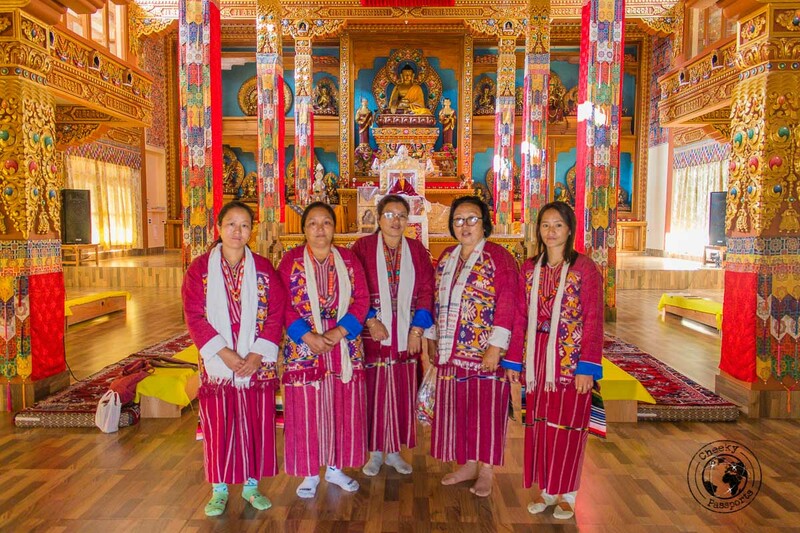 The newly-constructed 108 stupa area at Mandala village is the first of its kind in India and there’s a good chance that we were the first foreigners to have visited, according to Sange and the homestay owner! The site is very similar Dochu-La Pass in Bhutan where the pillars are constructed in circles around a central stupa which in this case was still under construction. It is clearly a very holy place for Buddhists and quite a few people had made it up here in the cold. Most of them were having small picnics around wood fires and we were more than delighted when Sange’s cousin and aunt, who had accompanied us up to Mandala, whipped out hot chai and snacks as we sat outside and took in the fresh but very cold mountain air. The site is located at the top of a mountain, so as we quickly discovered, it can get really cold up here. Be sure to take up jackets and even woolens with you! One of the most charming places to visit in Dirang, is actually another village located a few km away called Thembang Dzong. The quaint Monpa village is looking to achieve UNESCO World Heritage status and is considered to be one of the most ancient villages in the region. The village and its two gates have been constructed in the traditional Monpa system, and is located at the top of a hill. It can only be accessed via private vehicle. 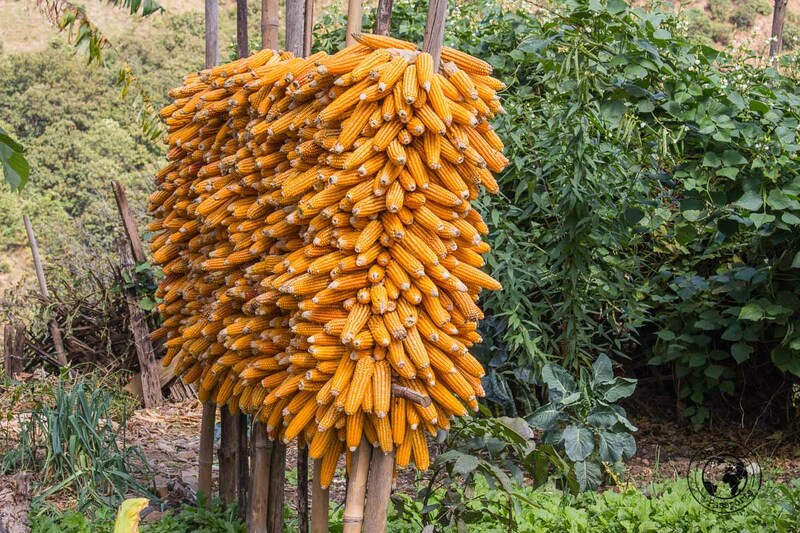 We loved walking along the narrow roads and smiling at locals who invited us into their homes so that we could observe local life where corn was drying over an open fire. The dzong is extremely quiet and one of the most unique places to visit in Dirang! We’re not sure about Dirang hotels, but Dirang is home to a number of homestays which are always preferable. We also advise you to stay in the Dirang Dzong area which is a lot prettier than the dusty Dirang town a few kilometers away. We stayed at a place called Tzering Homestay in Dirang Dzong as part of our tour which we highly recommend. We had all our very tasty breakfasts and dinners served in the homely kitchen round the stove and we even got a momo making lesson one night (which we both failed miserably at – it was lots of fun though!) Oh, and I got to drink lots of Ara (the local alcohol) with my dinner! Holiday Scout can help you with booking this lovely homestay. Dirang is less than an hour’s ride away from Bomdila, so to travel from Guwahati to Dirang, you can follow our advice in the Guwahati to Bomdila section, but get a sumo to Dirang instead of to Bomdila. If you intend visiting both Bomdila and Dirang, there are sumo services between the two. The tribal majority of Dirang and Bomdila in West Kameng, are the Monpa people who can also be found in Tawang. Most Monpas follow the Buddhist religion and are extremely friendly to foreigners (and were very curious about us too)! They speak a local language called Tshangla, but many also understand and speak Hindi. English is also taught at schools. Other tribes like Aka, Miji, Sherdukpen and Khawas can also be found in West Kameng. Do not expect the creamy curries and complex food typical of ‘mainland’ India in this part of the country! The food here is simple and consists mainly of curries which are more soupy and less heavy, accompanied by rice and roti (a welcome relief for some!). 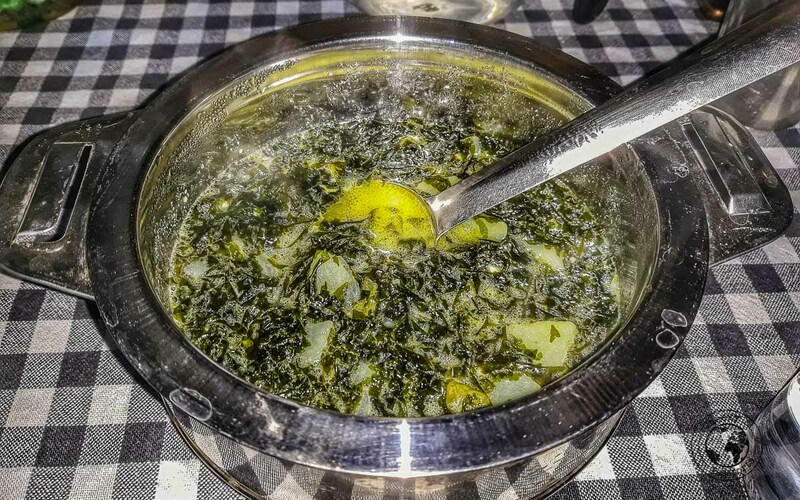 Additionally, Himalayan food such as momos and thukpa are extremely common and can be found on most restaurant menus. 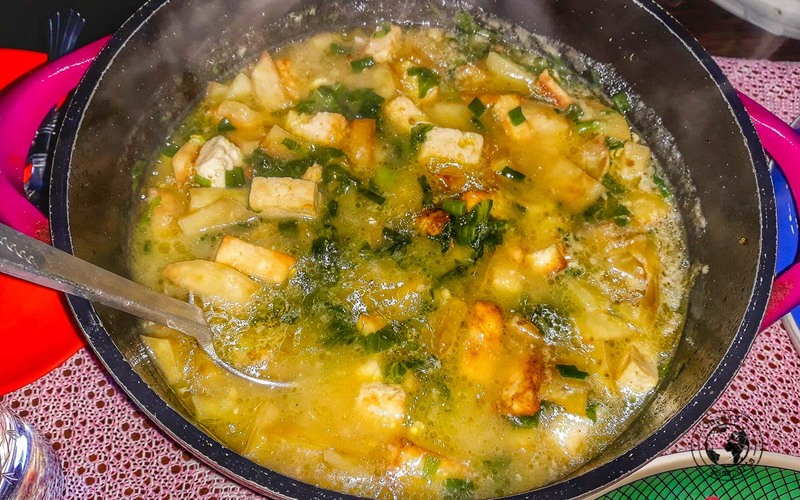 Vegetarian and non-vegetarian dishes are both available, with yak cheese and potatoes being widely used in local Monpa cuisine. Our favourite places to eat were the local homestays! Breakfast typically consisted of roti or tingmo (steamed dough) with curry or daal, whilst dinner was curry, daal, local rice accompanied by a couple of vegetable dishes. We both absolutely loved chura kamtang, a yak cheese curry with potatoes we couldn’t get enough of! We say both! During our tour in West Kameng, we found that there were so many off the beaten path places to visit in Dirang and Bomdila, that we would have hated to visit one and not the other. If we really really had to choose though, we would prefer spending our time in Dirang, which is a more ‘gentle’ place and which we thought was prettier than Bomdila, although the latter seems to be more popular. Do choose to stay at Dirang Dzong area over Dirang town though! We hope that this post helps you understand that Dirang and Bomdila in West Kameng are both worth more than a few hours’ stopover! 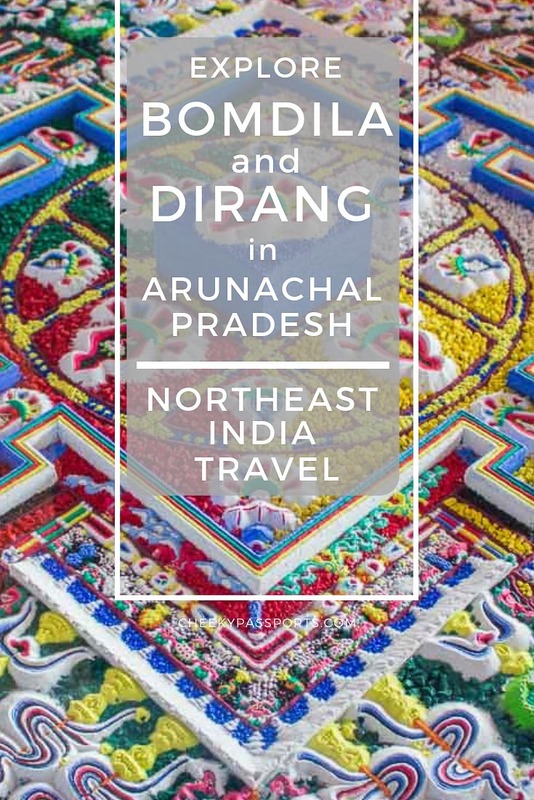 With Northeast India travel and tourism on the rise, and an increase in Dirang and Bomdila hotels and homestays, the region promises to be one of the most popular in Arunachal Pradesh! We would like to thank Holiday Scout for sponsoring our trip to Dirang and Bomdila. Opinions expressed in this post are, as always, our own.